Khaled Hosseini was born in Afghanistan and moved to the U.S. as a teenager. He was a physician before he published his first novel, The Kite Runner. There was a time around 2003, before e-books and e-readers, when it seemed that everywhere you turned — in an airport, on a bus or anywhere people read — people were lost in The Kite Runner. An epic tale set in Afghanistan, the book sold more than 7 million copies in the U.S. and catapulted the author, Khaled Hosseini, onto the global literary stage. 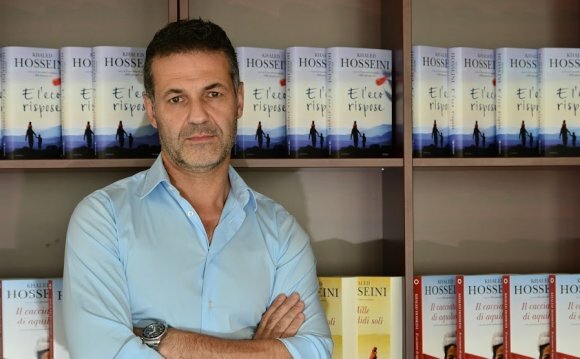 Hosseini followed that success with another book about his homeland, A Thousand Splendid Suns, which also became a best-seller. Abdullah would find himself on a spot where Pari had once stood, her absence like a smell pushing up from the earth beneath his feet, and his legs would buckle, and his heart would collapse in on itself ... Pari hovered, unbidden, at the edge of Abdullah's vision everywhere he went. She was like the dust that clung to his shirt. She was in the silences that had become so frequent at the house, silences that welled up between their words, sometimes cold and hollow, sometimes pregnant with things that went unsaid, like a cloud filled with rain that never fell. Some nights he dreamed that he was in the desert again, alone, surrounded by the mountains, and in the distance a single tiny glint of light flickering on, off, on, off, like a message. Hosseini talks with NPR's Rachel Martin about the image that inspired the book, the pressures of success and why he considers all his novels love stories. Kite Runner Redemption Essay Conclusion - Place your Order!